The fire began, it is thought, in the workshop of James Green, a cabinet maker. His shop was on the east side of Royal Street, in the middle of the main square, bounded by Fairfax, Prince, Royal, and King Streets. It was just before 9:00 a.m. on that icy cold Thursday morning; the temperature, one contemporary account said, stood at 13 degrees. 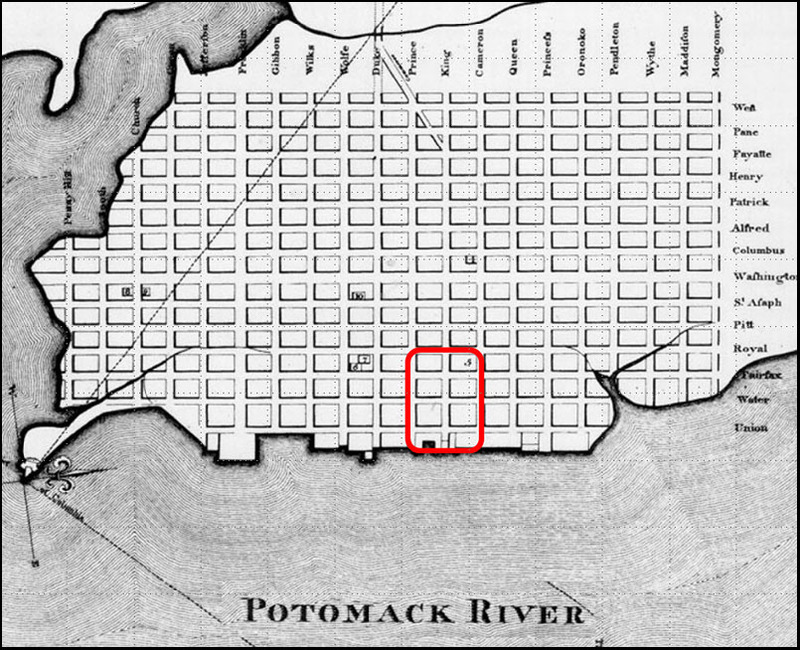 It was the 18th of January 1827, and the City of Alexandria, Virginia, was on fire. The back buildings of several houses on Royal-street were consumed, as was also a frame dwelling fronting on the alley, and immediately South of Mr. Green’s work shop. 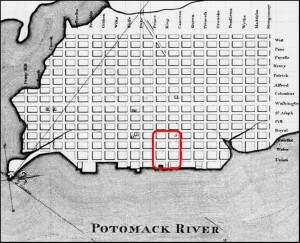 The fire soon reached Fairfax-street, …; … every other house on the West side of Fairfax, and between Stabler’s and Prince-street, were almost simultaneously in flames, and were speedily consumed. … (The fire) crossed over Fairfax street to the East, consuming two three-story brick houses fronting thereon… (L)ighted shingles, borne by a powerful north-west wind, had kindled another, and a still more awful fire, in a separate part of town. … In a few minutes, both sides of Prince street, between Water and Union, together with a warehouse on the east side of Water street — four others on the west side of Union street south of Prince, and three others on the same side of Union, north of Prince — were all in flames, and every house except two was destroyed — many of them with their whole contents. Faced with damages of that magnitude — well into the millions by today’s standards6 — the resident of Alexandria turned to the United States Congress for assistance and relief. And they ran into a snag. Despite the fact that Alexandria was, at the time, part of the District of Columbia,7 and had no power of taxation or legislation of its own, some members of the House of Representatives expressed their doubts that Congress had the constitutional authority to appropriate public money for the aid of private citizens. 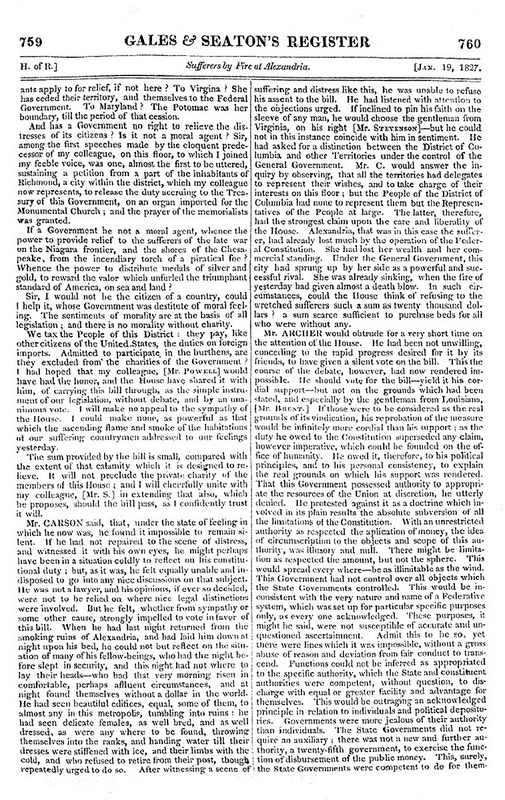 And what they said was reported in the Register of Debates, a privately-published summary of congressional debates for the years 1824 through 1837. Everything the representatives were concerned about, the facts marshaled to support arguments for and against the bill to grant the princely sum of $10,000 for the relief of Alexandria — it’s all there in the pages of these reports. The simple fact is, there’s a wealth of information just waiting to be found in the volumes published over the years containing the debates of Congress — available in their entirety for the period from 1789 through 1875 — at the Library of Congress’ American Memory website. 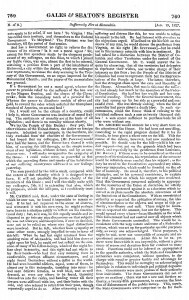 The Register of Debates is a record of the congressional debates of the 18th Congress, 2nd Session through the 25th Congress, 1st Session (1824-37). It is the second of the four series of publications containing the debates of Congress. It was preceded by the Annals of Congress and succeeded by the Congressional Globe. There are fourteen numbered volumes in the Register of Debates series, resulting in a total of twenty-nine bound items. While each volume consists of an index, more complete access to the information may be obtained indirectly by using the indexes of the House and Senate Journals during the relevant session of Congress, which provide the dates on which action was taken. These dates can then be consulted in the Register of Debates. Appendixes include, but are not limited, to presidential messages and the text of laws. The Register of Debates is not a verbatim account of the proceedings, but rather a summary of the “leading debates and incidents” of the period. It was published contemporaneously with the proceedings by a commercial printer, Gales and Seaton. And that’s just on this one singular incident. All told, the Library of Congress has all of the first set of debate reporters, the Annals of Congress, covering the first through 18th Congresses (1789-1824); the Register of Debates, covering the 18th Congress, 2nd Session through the 25th Congress, 1st Session (1824-1837); the Congressional Globe, covering the 23rd through 42nd Congresses (1833-1873); and the Congressional Record for the 43rd Congress. The search function only covers the index to the debate reporters, so it’s not an every-name function except for the names of those members of Congress who actually spoke on a subject. But the subject index is decent — a search for the word “slavery” in the Register of Debates produced 100 hits; the word “piracy” produced 27; the phrase “lead mines” 11 exact hits. The debates can be technical (only a law geek like The Legal Genealogist is going to appreciate whether the bill was laid on the table twice or not) but it’s easy to skim past the procedural details to the wealth of facts included in the arguments of the members. Give it a try. You never know what tidbits about your family, or about a situation your family might have faced, might be lurking in those pages. The Alexandria Gazette, still published, is my local paper. I live a few blocks from the location of that fire. Water Street is now Lee St. Imagine debating for help from the fire effects when there was such urgent need. Amazing records, Judy. Thanks for posting. Especially when you consider that they’d approved other aid to other people — including foreign nations — after other disasters! I’d have been most annoyed if that bill hadn’t passed! That’s a fascinating slice of Alexandria history. Thanks for posting. We regularly visit the restaurants in that corner. It must be the area where Virtue Feed & Grain, Union Street Public House are located. And the site of a long running legal action between the City of Alexandria and the Old Dominion Boat Club. That’s the general area, Patrick!